On Saturday, November 19th, the Turtle Journal team led by Rufus discovered a male torpedo ray that had washed ashore on the eastern side of Loagy Bay opposite Lieutenant Island on Outer Cape Cod. Surprising to most residents, the torpedo ray (Torpedo nobiliana) is a regular sight on Cape Cod bayside shores each Fall as they strand for what still remains unknown reasons. What makes them especially “stunning” is their 220 volts of electric charge! In October and November, our team has discovered beached torpedo rays along bayside Cape Cod beaches from Truro to Sandwich. 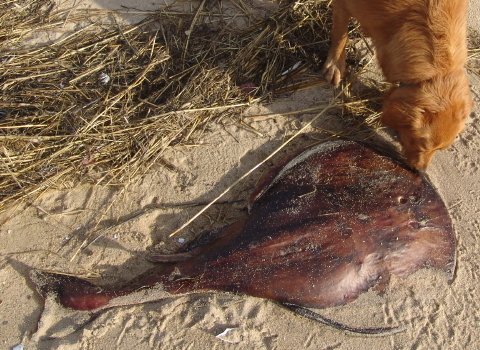 In November of 2008, we found many torpedo rays that had washed ashore, beginning on Guy Fawkes Day; see http://www.turtlejournal.com/?p=1448 and subsequent postings. The male torpedo ray Rufus sniffed out of the Old Wharf Landing wrack line on Saturday was fully intact without any outward sign of injury. 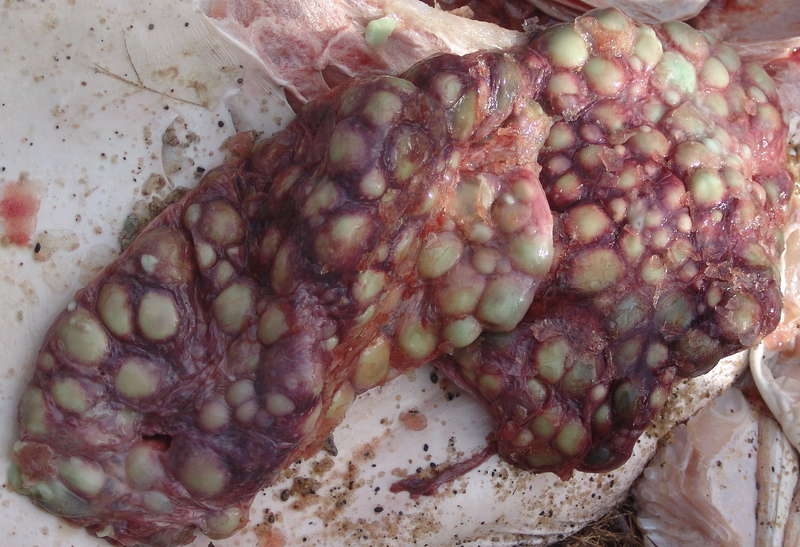 Our necropsy of other Fall beached specimens have likewise pointed to no obvious cause of death, which has suggested that their stranding may be somehow associated with a cold-stunning phenomenon. As faithful Turtle Journal readers know, we see these torpedo ray and also ocean sunfish strandings at the leading edge of cold-stunned sea turtle stranding season each Fall. 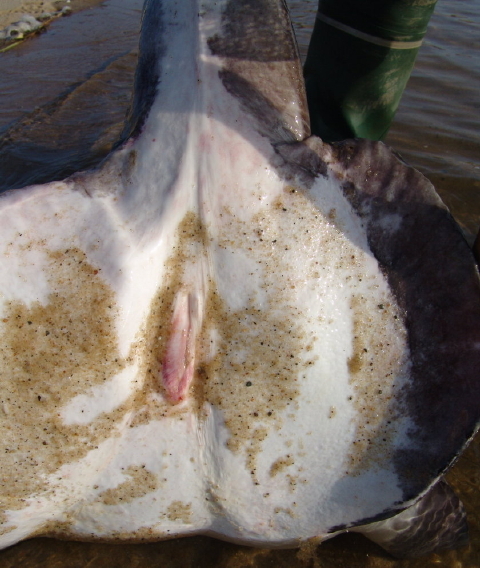 The gender of this specimen can easily be discerned by its claspers pictured above. For those who may not be familiar with the torpedo ray, a group within which we blissfully counted ourselves until a few years ago, this fish is an electric ray that can deliver a 220-volt charge in a short duration burst. The torpedo ray is a cartilaginous fish … like sharks and skates. 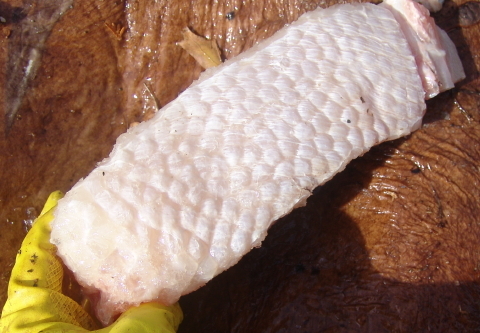 Its shape is a round, flat disk with a relatively short, large caudal fin that has two dorsal fins. While this ray can reach 6 feet long and 200 pounds, most torpedo rays taken from the Atlantic fall in the 75 pound range. (We necropsied a 150-pound female torpedo ray this season.) 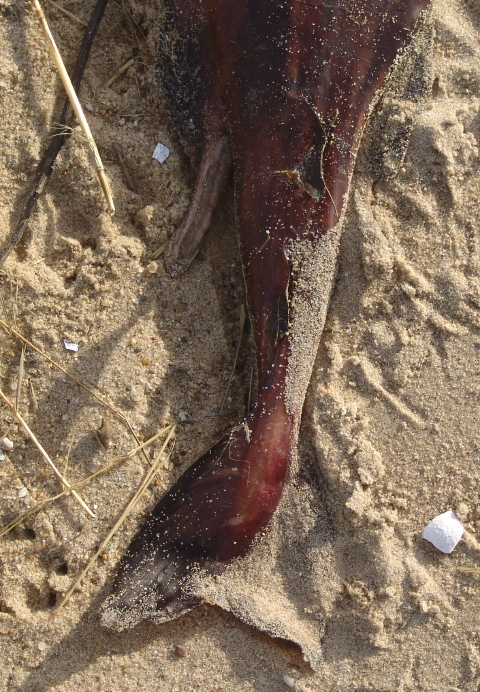 It does not have spines or thorns that are characteristic of common skates. 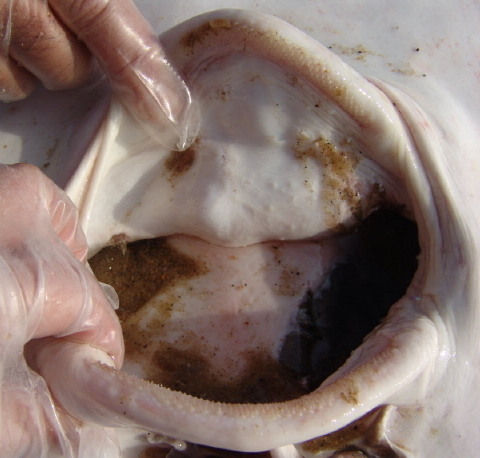 Small eyes are set forward and this ray’s color is brownish or purplish on the dorsal (top) surface and white on the ventral (bottom) side. 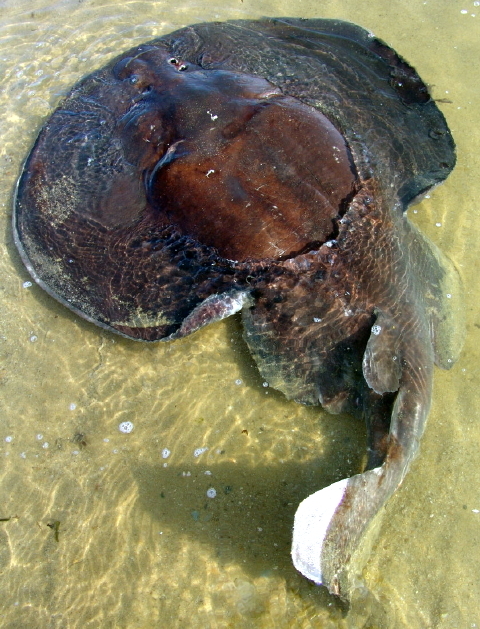 Habitat for the nocturnal torpedo ray is benthic (bottom of the sea) where it buries itself in the sand during the day. While described as pelagic, torpedo rays can be found mostly along the continental shelf in water from 10 to 350 meters deep. They are not common within inshore waters. 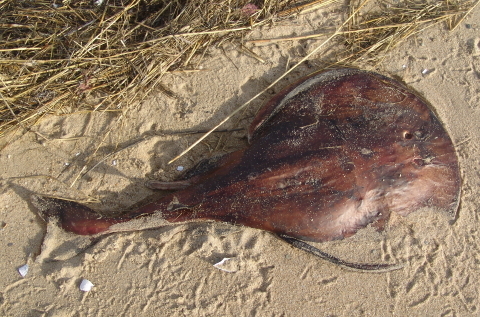 This fish is the only electric ray that is found in the northwest Atlantic Ocean and historic records document torpedo rays in Vineyard Sound, Buzzards Bay and Cape Cod Bay, especially the Provincetown area. This specimen was identified as a female with pelvic fins and no claspers. The eggs sacs above were removed from a large, 150-pound female torpedo ray that stranded in Cape Cod Bay this year. Note the varying sizes of the individual eggs within the sacs. Two egg sacs were discovered in a band located anterior of the two large liver lobes. Factoid: Torpedo ray females bear live young. November 14th saw the release of the last diamondback terrapin hatchling of 2011. What is a hatchling doing in the Great White North in mid November? Good question! 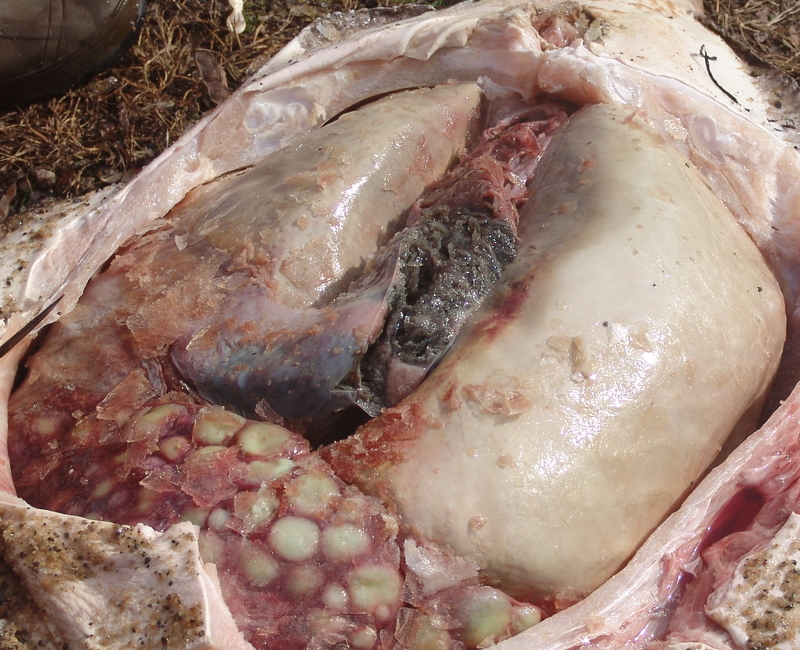 As nests hatch out during the season, Turtle Journal often finds a few seemingly non-viable eggs lying at the bottom of the nest, looking in pretty sad condition. They’re often sunken in and darkly discolored. For all intents and purposes, they’re goners. But we decided a decade ago to give these sorry-looking eggs a second chance; a last chance, really, to survive. We place them in clean, moist sand and keep them in a warm environment. Miraculously, we find a couple of hatchlings each year that earn that second chance at life, usually surfacing at the top of their bucket around Veterans Day or Thanksgiving or even Christmas. Once such survivor emerged over the weekend. On Monday, the 14th, Turtle Journal’s Sue Wieber Nourse and Rufus brought the lucky survivor back to her natal site at Turtle Point on South Wellfleet’s Lieutenant Island. The weather was gorgeous with sunshine and nearly 70 degree temperature. 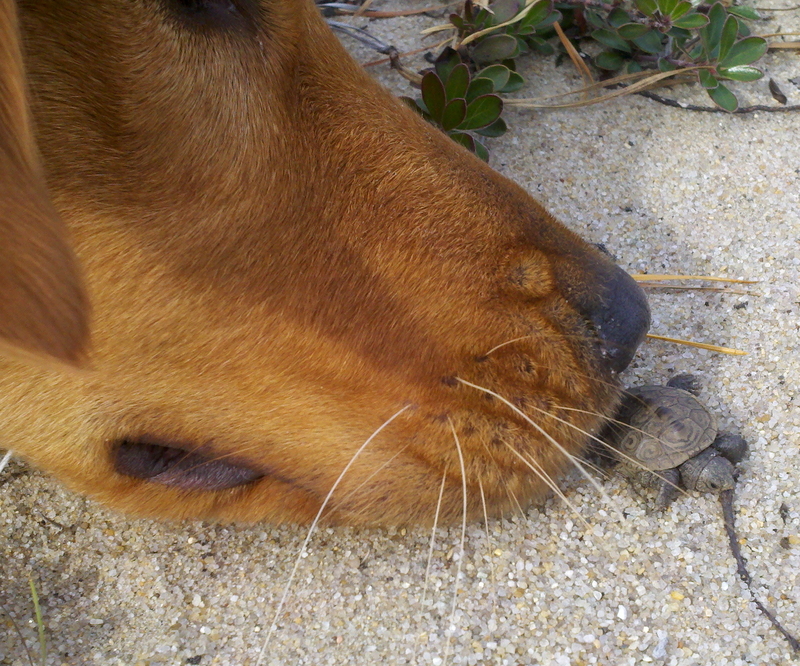 Rufus, who celebrated her first birthday this weekend, couldn’t allow the baby turtle to escape into vegetative camouflage without whispering a few woofs of advice and giving her a gentle doggie kiss for good luck. A little hesitant at first to trade the safe, warm conditions of Turtle Journal refuge for the unpredictable wilds of freedom on Outer Cape Cod, the hatchling slowly acclimated to her new surroundings. Within a few minutes she decided on her course of action and headed slightly upland to the bear berry (hog cranberry) vegetation of the embankment at the edge of Turtle Point. She will burrow into the soft sand and spend her first winter in the deep slumber of brumation, waiting for the warm sunny days of May. 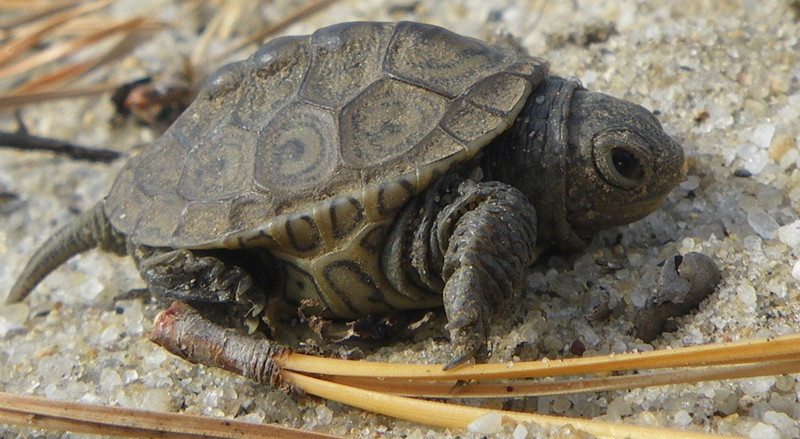 For now this sweetheart has the title of the last diamondback terrapin hatchling of 2011. Of course, with any luck, we hope to see that record broken by another sorry-looking egg and second chancer that will emerge while the Turtle Journal family is gathered for Thanksgiving or perhaps even Christmas dinner. Turtle Journal proudly salutes our colleagues in Southwest Flordia for their outstanding efforts in protecting sea turtle nests along the Gulf Coast. 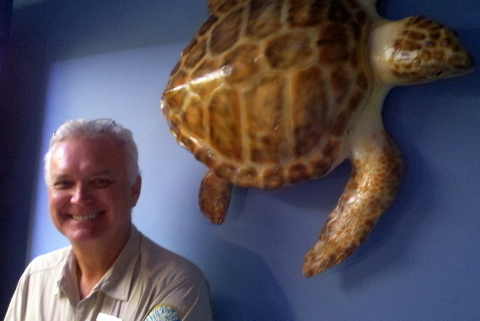 According to Turtle Journal’s friend and colleague Ranger Randy Sarton, who leads Nature’s Wonders at the Naples Ritz Carlton on Vanderbilt Beach, preliminary data for the 2011 sea turtle nesting season has been compiled. Randy reports that Collier County had a total of 761 nests this season; one more than last year. Lee County, says Ranger Randy, held steady with last year at 89 nests. Sarton summarizes that 2011 marks the second consecutive year with relatively good, or at least improved, numbers. On the beach in front of the Ritz Carlton Hotel itself, Randy said they enjoyed five nests this last summer. Turtle Journal’s Sue Wieber Nourse patrolled Vanderbilt Beach in Naples on November 1st and ran into this handsome male gopher tortoise strolling the beach near the Ritz Carlton. 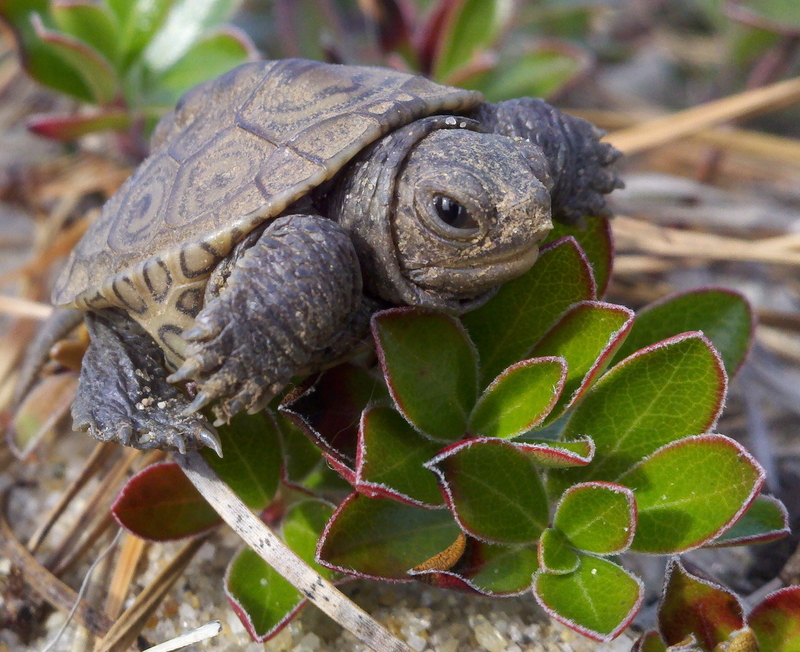 While protecting sea turtles that choose to nest on the Gulf Coast of Florida is a noble venture, threatened gopher tortoises (Gopherus polyphemus) spend their entire lives within a few tens of meters of their burrows. The survival of Florida’s gopher tortoises rests fully and completely in the hands of Floridians. 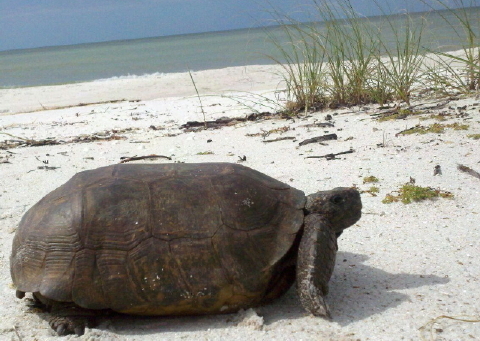 Whether gopher tortoises survive or fade into extinction is a decision for Florida to make. They remain Turtle Journal’s favorite reptile species in Florida, and it would be a shame for Florida’s children and grandchildren and great grandchildren to lose the experience of these fabuluous native megafauna. Turtles survived the dinosaurs, survived the asteroid that destroyed the dinosaurs, survived the giant lethal North American mammalian predators and even survived the arrival of humans on our shores, but they can’t seem to dodge the thoughtlessness of human modernity. Thanks to the great work of Nature’s Wonders, protection of native species remains an important topic of study for youngsters from two to one hundred two. 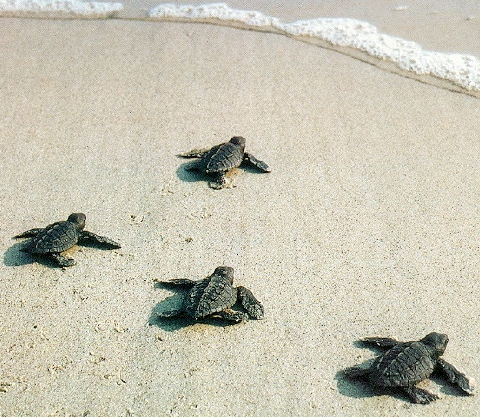 You are currently browsing the Turtle Journal blog archives for November, 2011.